The NFL's star players have it made. They are sports heroes. They have multi-million dollar contracts and endorsements. The players who are the best of the best at their position can make hundreds of millions of dollars over the course of a professional football career. So, why do so many NFL players blow it all? An April 2015 study revealed that about 16 percent of NFL players will go broke within 12 years of retiring from football. And unfortunately, NFL players who lose it all do not follow a set template. Their paths to bankruptcy (or worse) are as diverse as their playing styles. From run-of-the-mill bad money management, to multiple baby mamas to murder… these 15 former NFL stars gambled it all and lost big time. The Baltimore Ravens defensive back had been out of the league for a few years by 2011 when he started running into trouble. He found himself back in the headlines when news surfaced that he was flat broke and living with his parents. He couldn't even afford child support. In court documents he admitted: "I live in my parents' home. My parents provide me with my basic living expenses as I do not have the funds to do so." Running back Travis Henry once signed a five-year contract for $22.5 million. He played in the NFL from 2001 through 2007 during which time he had nine kids with nine different women. Not surprisingly, this over procreation is the main reason he was broke by March 2009. However, nine children and nine baby mamas were not the biggest problem Henry faced. Later that same year, he was sentenced to 3 years in jail on drug charges. "The Deuce" earned $70 million while playing in the NFL. He played 13 regular season games in 2008 for New Orleans, but was cut during the off-season due to an insane salary. Once he was no longer playing professional football, he went into the car dealership business. That quickly went wrong for him and he filed for bankruptcy in 2009. Vince Young was one of the most exciting college football quarterbacks of all time while he was at the University of Texas. Once he got to the NFL however, Young couldn't seem to keep it together. After being named the Rookie of the Year in 2006, Young cracked under the pressure. In September 2008, Young left his home without his cell phone and was briefly thought to have disappeared. He was reportedly upset over being booed by fans after throwing a second interception the previous day. Tennessee Titans head coach Jeff Fisher called the Nashville police after Young's family expressed their concern and he was found four hours later. In September 2012, the AP reported that Young had spent most of the $34 million he'd earned in the NFL and had defaulted on a $1.9 million high interest payday loan. He filed for bankruptcy in 2014. Johnny Unitas was a legendary quarterback for the Baltimore Colts. If he was in the league today, he'd be a superstar pulling down tens of millions per year. Unfortunately, Johnny filed for Chapter 11 bankruptcy in 1991 to protect his assets when he could not pay on loans in the amount of $4 million. Tiki Barber seemed to have it all after the 2006 season. He had just retired from the NFL, was beloved by New York Giants fans, had a great gig hosting and commenting on TV, lucrative endorsement deals, a beautiful family, and a healthy bank account. The former running back threw it all away for an affair with a 23-year-old woman (whom he later married). Barber also turned surly to the media and took a cheap shot at Eli Manning and Giants head coach Tom Coughlin after he retired. Soon, the TV deals and endorsements dried up and he was no longer loved by fans of the New York Giants. Terrell Owens had swagger back in the day. He was an amazing athlete, a handsome man, and he brought home $80 million as an NFL player. It seemed like Owens would be able to play forever, but even the best athletes retire. By 2012, it was all gone. Owens was completely broke and friendless. He was last spotted on a Los Angeles area friend's Tinder feed, looking for love. Michael Vick was, of course, arrested, convicted, and jailed on felony animal cruelty charges when he was found to be the leader of a dog fighting operation involving Pit Bulls. He was sent to jail and he filed for bankruptcy. He would be higher on this list for his reprehensible actions, but when he was released from prison, he resumed his NFL career, had spoken out against animal fighting, paid his debts, and has done lots of work with the Boys and Girls Club of Philadelphia. The former running back for the Baltimore Ravens has not lost everything as he does still have enough of his NFL money to live comfortably for the rest of his life. He did, however, lose his NFL career when the Ravens cut him from their roster after a video of him brutally beating and kicking the woman (who is now his wife) was released to the public. He was reinstated by the NFL but will likely never play another down in the NFL. 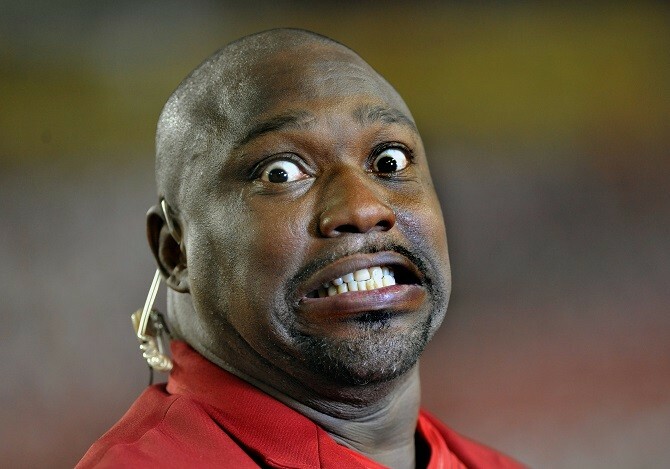 Warren Sapp was a four time All-Pro defensive tackle who was inducted into the NFL Hall of Fame in 2013. After his professional football career was over, he worked as an analyst for the NFL Network. Sapp should not have had any money problems, but he blew through his fortune in spectacular fashion and filed for bankruptcy in 2012. Things haven't gotten better for Sapp. In February 2015, he was charged with soliciting prostitutes the night after the Super Bowl. The arrest cost him his gig with the NFL Network. Mark Ingram, Sr. was a part of the New York Giants team that defeated the Buffalo Bills to win Super Bowl XXV. He played professional football from 1987 until 1996. In 2008, he was sentenced to more than seven years in prison after being convicted of money laundering and bank fraud. He received an additional two years in prison in 2010 when he jumped bail to watch his son Mark Ingram Jr. play football. Bernie Kosar is still a beloved Cleveland Browns quarterback as he is the QB who has come the closest to taking the Browns to the Super Bowl. However, after out of control spending combined with a bunch of bad investments and the downturn of the economy, Kosar filed for bankruptcy in 2008. He tacked on an embarrassing DUI charge (that was later dropped) to his woes and lost his gig as an in-game commentator for the Browns. O.J. Simpson was acquitted of the murders of his ex-wife Nicole Brown Simpson and Ronald Goldman. Whether he did it or not – and there are still plenty of people who will argue for both sides – after the criminal and civil trials, the former USC and Buffalo Bills standout could have moved on with his life. However, that is not the road Simpson took, and in 2007 he was arrested on charges of armed robbery and kidnapping. He was sentenced to 15 years in prison. Rae Carruth had a lot of promise when he was drafted by the Carolina Panthers in 1997. He signed a $3.7 million, four-year contract to play wide receiver. However, just two years later in 1999, Carruth hired a friend, Van Brett Watkins, Sr. to shoot the woman Carruth was dating at the time. Watkins shot Cherica Adams multiple times. She died a month later. Carruth was convicted of conspiring to commit first degree murder of the mother of his child and sentenced to 24 years in prison. Aaron Hernandez was a standout tight end for the New England Patriots with a $40 million contract extension in 2012. What the public did not know was that just one month before Hernandez landed that deal, he allegedly gunned down two individuals. In April 2015 he was convicted of murdering his friend Odin Lloyd. He has a rap sheet going back to 2007 and by all accounts is a sociopath. In a recent Dr. Phil interview, Hernandez's fiancée Shayanna Jenkins-Hernandez, discussed who she thought would be entitled to that money, as well as other thoughts surrounding the circumstances of Hernandez's death.